Discussion in 'Offroad Drivelines' started by Trckmagik, March 1, 2004. Kewl. Please lets see some pics of what was done. I have a shop ready to help out, but nothing to go on. I figure I'll let you save me from going in blind. Paint job? WOW you are not messing around! I wish I could do my paint over, my 5 year old Maaco job is in bad shape...time for some rust repair...poor old BII had 260K miles now. Kris, what are you doing in the rear to match the new bolt circle? Spacers or axleshafts? or a 9"??? This thread may help you guys.. Thanks alot Doug. I posted over there also. I will update this thread as we go. Well I have the Knuckle mounted to the Spindle. Every thing seams to fit well now. The Lower ball joint had top have a little machine work to sit low enought to get the snap ring on. This Might fix the problem Byrd Had with the U-joint hitting the Lower Joint. If anyone is interested in having knuckles machined to fit You can PM me and I can have this Set up duplicated. I would need a set of Upper and Lower Ball Joints for an Explorer and just the knuckles. How much to duplicate what you have done? Exactly what would need to be sent to you? 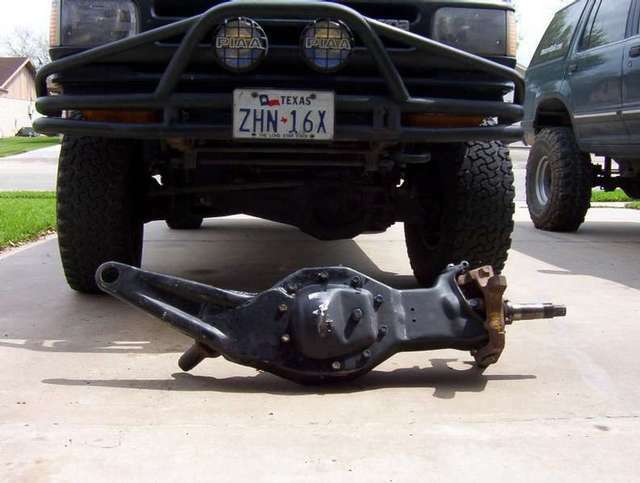 Your looking about $250.00 if you ship me the Bare Knuckles and a set of New Explorer Ball joints. And then what else would need to be done for this to work? If I understand correctly that should get you to this point that Kris is at, knuckles mounted to the beam. mount the rotor, bearings, and caliper. I wonder if the D44 caliper brake lines bolt up to the truck? Also for you ABS guys if you want front ABS you might have to deal with mounting that sensor, or getting D44 knuckles with the sensors and the appropriate rotors. Looks great so far! That spindle looks like it needs a little "clean up"
The stock or extended brake lines from the explorer should screw right in to the brake calipers. Driver side Axle fits with out problems so far. I am Having trouble with the Passenger U-joint and the Cut and Turn beam have a clearance issue so once that is Taken care of I should not have too much more to do and can start work on the Rear set up. I will be installing new Axle shafts in the 8.8 to get the 5 on 5.5 pattern. 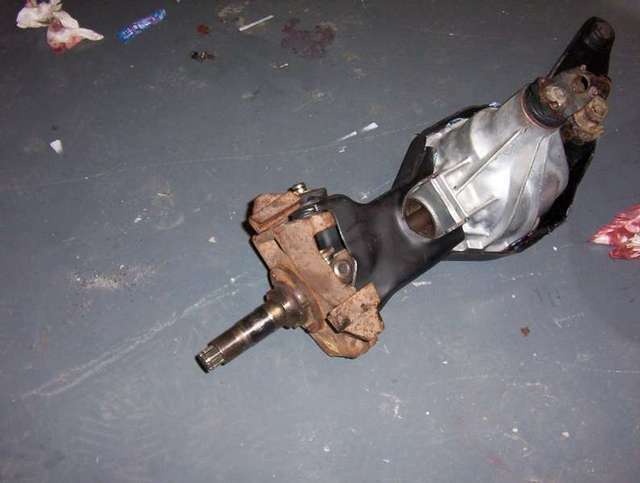 As well as 4.56 gears with some sort of locker. Yes this is not a light hearted Swap. But this It part of the Major retooling of my 92 Navajo. My Navajo is Getting the cut and Turn 44 spindles Extended Radius Arms, Sprung over Rear with 4.56 gears 35x12.50 17 BFG Mudd Terrains also new paint. Tail gate replaced and Custom hood. I thought I'd chime in here because I was involved in the other thread. I did not actually do this mod. The info I posted was a cut and paste if you read carefully the first post in the other thread. I also am very interested in this mod and will be going the same direction as Kris with cut and turned and D44 outters. Can you explain why both the knuckle and the ball joints need machining. I seem to be missing something here. Or maybe a diagram of the machined parts. Thanks a bunch. You have to use explorer ball joint to get it to align. You will also need the Tie rod mount reversed. The lower Ball joint needs some machining to get the snap ring on the lower joint. Ok I have Completed the Driver side beam set up. There was another issue with Steering clearance on the dana 35 beams I took care of the clearance issues with my angle Grinder. There will not be a problem with the Axle shafts. And there are no clearance issues with the Ball Joints. Can be aligned like factory. You got those beams from Brett or did you build them yourself? I know you didnt increase the track width with the beams but I wonder if the D44 knuckle moves the wheel out any compared to the D35?? I have continually checked the beams after each outing for any signs of weakness. I beat the living &*^# out of them and they show no signs of weakness. Next time I have the pass side axle shaft out I will be clearancing the hole in the pass side beam just a little more, I already spent a while with the grinder, but at full droop the shaft was touching a little. 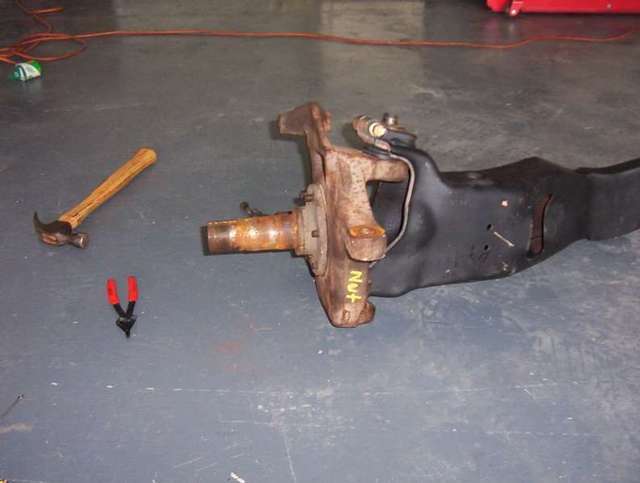 Are you going to keep the C clip or run the spring in the slip yoke? CANT wait to see this all done! I see Camburg uses a 1" uniball instead of the axle pivot bushing, that may work pretty well! I found it bnecessary to tack weld the rubber Ford axle pivot bushings (collar) to the beam, on the last 2 sets of bushings I had they would work themselves loose and allow the beam to move forward and back slightly inside the axle pivot bracket. Nice going! I now king you "Sir. Uncharted Waters"
Very nice work Kris. I will be checking with my machine shop here locally, but I may be sending you my outers and some ball joints. Thanks for the pics and information you have posted thus far.